Display a Flattr button with the FlattrButton component provided by the SDK. It extends the View class and can be used just like any classic component. Show your thing to your users with FlattrSDK.displayThing(). This call invokes the Flattr app developed by Flattr4Android. If the app is not installed, the user can either download it or go to Flattr web site. Invoke the Flattr app yourself by calling FlattrSDK.getDisplayThingIntent(). Adding a Flattr button to your app is probably the prefered way to use the SDK. 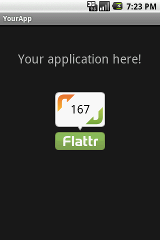 When your users click the button, your app's thing is presented through the Flattr4Android app. If they do not have the Flattr4Android app, they are invited to install it or to see your thing on the Flattr web site. Click count: how much time the thing was clicked? This information is public and can be obtained via the REST API. Thing status: did the logged user already flattr this thing? This information is private to the user. It can be retrieved with the help of the REST API, for the authenticated user only. Fill the token, token_secret and thing_id with the credentials and thing Id you got during the SDK installation. Choose your button look by setting the button_style attribute. Allowed values are vertical and horizontal. That's all! Your button is up and ready. Your users can now flattr your app. If the Flattr4Android application is installed, it is invoked. Your user is presented a clear page where he can flattred your thing immediately.